People truly are thinking of Christmas. Yesterday I met a woman who said that she has all of her shopping and wrapping done by Halloween, so she can relax, enjoy, and have fun looking at the lights come December. I might try that this year. I've always wanted to. There was another woman in my booth who said she can't possibly think of buying Christmas gifts until it gets cold. I know what she means! 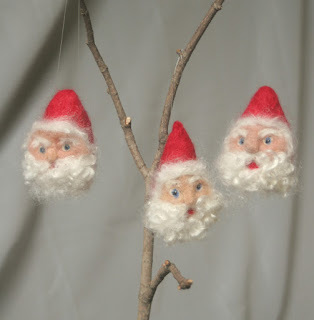 So these Santas are for a lovely Etsy customer. I'll be making more for my markets as soon as I can.